Satya Narayan Maharana, a youth from Berhampur of Odisha, has entered into the ‘India Book of Records’ for constructing an image of Lord Ganesha using smaller Ganesh idols carved out of 207 pieces of soap. Satyanarayan, an amateur artist and miniature sculptor, said he had started constructing the image of lord Ganesha on September 5, which was also the day of Ganesh Puja. The work was completed in five days, on September 10. Like his other works, Satyanarayan preferred to use household items for his project. 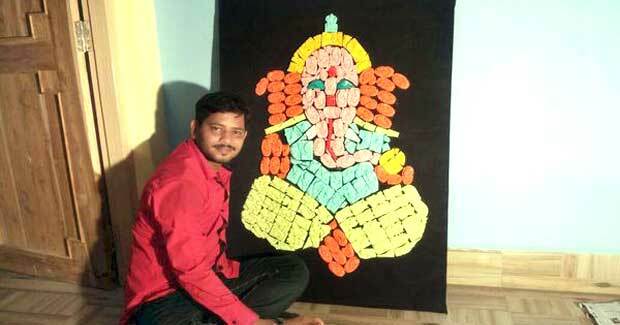 The image of Ganesha was made out of 207 soap pieces. Each of these pieces were carved miniature idols of the deity and were unique in some way. Earlier this year, Satya Narayan had also found a place in the India Book of Records for constructing the smallest scaled models of the three chariots of the famous Rathyatra of Sri Jagannath temple in Puri. Satya Narayan, a graduate, took up miniature sculpting and sand art as a hobby. Most of his family members are amateur sculptors. His elder brother Sanjay constructs clay idols, as did his father Subash Chandra Moharana. Satyanarayan’s younger brother Laxminarayan is trying his hand in miniature sculptures using chalk pieces.